Jamie Scholes retained his National Open Water Festival title with victory in the Boys 17-18 Years age group. Having won the gold medal last year, the City of Peterborough swimmer came home again first at Rother Valley County park in a time of 58:54. Jamie said: “It’s the second year in a row I have won and used pretty much the same tactic which was to hit it from the start. “I knew that if I got a big enough lead at the beginning, they wouldn’t be able to catch up with me. George was just behind me after the first lap but I managed to increase that lead. “It was a little bit slower than last year but the conditions then were much calmer so I’m happy with my time. Henry Pearce won’t forget his third ever open water swim – as he was crowned national champion. The City of Peterborough swimmer was told by a friend he should try open water swimming as ‘he would be good at it’. “It turns out I am,” said Henry, who finished in a time of 1:01.58 to win the National Open Water Festival 16 Years Boys 5k by an impressive 48 seconds. “I’m pleased with my swim. It was a lot harder than I was expecting as the conditions weren’t great but it was a good race. “My coach said to go out strong and test the waters, cruise on the next lap and then really push on. Luckily no-one came with me. Northampton’s Jackson O’Rourke took the silver medal in a time of 1:02.46, while Wycombe District’s Joshua Williams finished third in 1:02.47. Ryan Reader won his first National Open Water Festival title in the Boys 19 years 5K race but needed a sprint finish to take the gold medal. He clocked 58:10 to take the gold medal but the Derventio eXcel swimmer was pushed all the way by second-placed Bailey Hairsine (City of Manchester Aquatics) who recorded a time of 58:14. Bath University’s William Ryley won the bronze medal in 59:12. Ryan said: “It’s my first time as national champion and it was nice to stand on top of the podium. “The windy conditions weren’t great or ideal but it was nice to be able to race in different conditions and get some more experience. “It was a good race. On the last lap, it was just me and Bailey and it was nice to come down to a sprint finish, which was quite exciting. 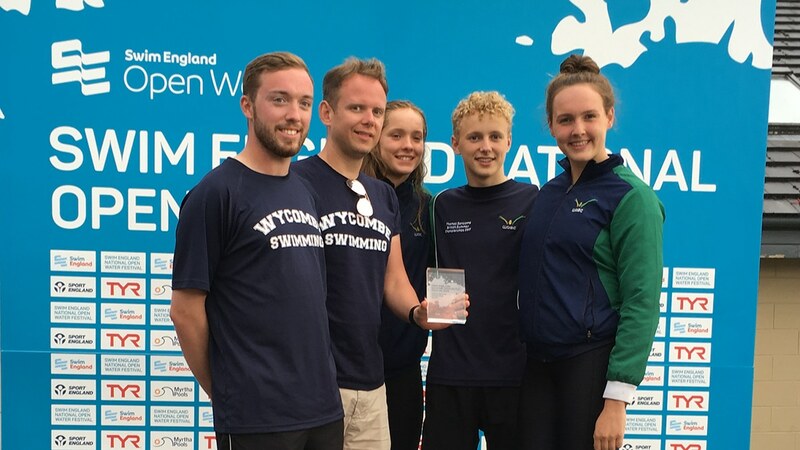 The National Open Water Festival Top Club trophy was presented to Wycombe District Swimming Club. Swimmers from the team achieved seven podium places, including three gold medals.